Our final honeymoon stop will be Rome. I've been to Rome before, on a whirlwind Italy and Greece tour with six girlfriends, but I'm so excited to stroll the streets with Ian. We planned Rome as our final stop since we figured by then we might be ready for some more action and Rome is a fast-paced city with LOTS of sights to see. 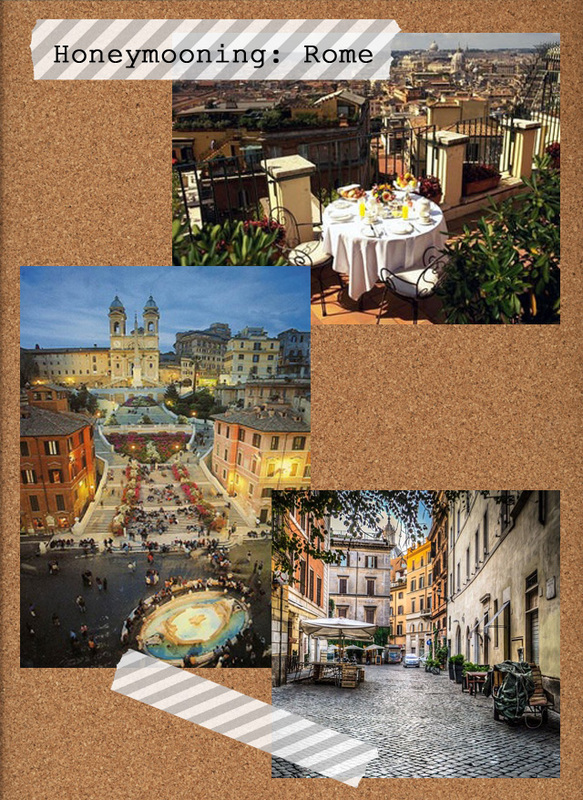 We'll be staying at the InterContinental, located at the foot of the Spanish Steps (the top picture is a balcony at the hotel), thanks to a gift from my brother Craig and sister-in-law Ryan Marie. Do you have any Rome recommendations for us? We'd like to go off the beaten path a bit. What a great place to end your honeymoon! I did a 3 week Mediterranean cruise a few years ago and we started and ended in Rome. Picnic in the Borghese gardens (not too far from where you'll be staying). Definitely check out the restaurants in Trastevere - Antica Pesa is a favorite!